There are describe image PTE Tips which can be used for all describe image task in PTE academic exam. Even if you don’t understand anything from the image or graph, you should try to speak as much as possible using good English vocabulary and fluency. You should talk at least for 30 seconds and try to talk till 35 seconds and then once done, click “Next”. Do not speak for 40 seconds as it might cut your sentence in between. You just need to remember the below lines and fill the gaps as per needed for your task. This bar graph/ line graph/ pie chart represents the ………. (X-axis parameters and title)…………… including ….. (Y-axis or other parameters)……. First of all, The highest amount of …. is … and …… accounts for the lowest amount of …..
Second / Moreover / Furthermore, …… (after 1960 it started declining/ increasing / fluctuating) …….. In contrast, ……(before 1960, it was actually higher / lower than in any other period) ……………. accounts for, by contrast, in comparison, dramatically declined, fluctuated, highest, lowest, peak point, bottom point, overlaps, connects to, North East, South West, North West, South East, left side, right side, clearly, obviously, in particular, especially, alternatively, even though, increase, decrease. Fillers: In addition to that, Overall, To conclude, In conclusion, moreover, furthermore, First, Second, Finally, To begin with, To sum up, Similarly, Likewise, In the same way, Hence, as well as, not only .. but also, Therefore, Thus, Consequently, For this reason, Initially. With good practice, you would be able to get the full marks in this task. It is really not hard to talk for 40 seconds as it would just test English content and fluency and not your knowledge of the topic. >> 5 = Describes all elements of the image and their relationships, possible development and conclusion or implications. >> 4 = Describes all the key elements of the image and their relations, referring to their implications or conclusions. >> 3 = Deals with most key elements of the image and refer to their implications or conclusions. >> 2 = Deals with only one key element in the image and refers to an implication. >> 1 = Describes some basic elements of the image, but does not make clear their implications. >> 0 = Mentions some disjointed elements of the presentation. All vowels and consonants are produced in a manner that is easily understood by regular speakers of the language. Vowels and consonants are produced clearly and unambiguously. Most vowels and consonants are produced correctly. Some vowels and consonants are consistently misproduced in a non-native-like manner. Many vowels and consonants are misproduced, resulting in a strong intrusive foreign accent. Pronunciation seems completely characteristic of another language. Speech shows smooth rhythm and phrasing without any hesitations, repetitions, false starts or non-native phonological simplifications. Speech has an acceptable rhythm with appropriate phrasing and word emphasis. Speech is at an acceptable speed but may be uneven. Speech may be uneven or staccato. Speech has irregular phrasing or sentence rhythm. Speech is slow and laboured with little discernable phrase grouping, multiple hesitations, pauses, false starts and or major phonological simplifications. Candidates have 40 seconds to describe the image or a table or chart or map. Question: Look at the map below. You are required to study the Table for 25 seconds and give your answer in 40 seconds. This types of question come under long answer type. 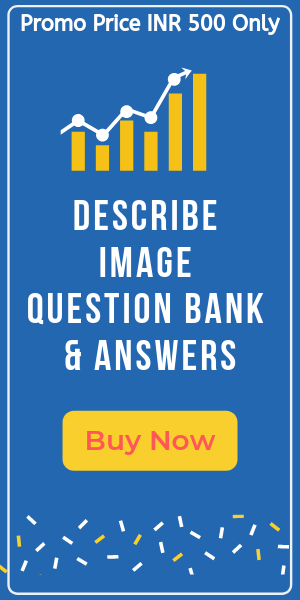 These question evaluates fluent speaking ability and requires test takers to depict a picture from a scholastic material, for example, a graphical image, map, table or picture. 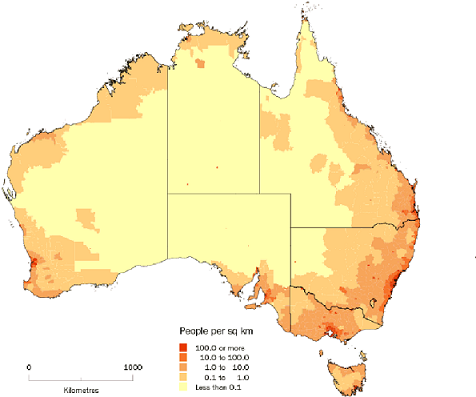 The provided map represents Australia’s population strength in June 2010. Australia has an uneven population circulation. In June 2010, 2/3 of the country’s population lived in capital urban areas. A snappy look uncovers the immense Outback as scantily populated and reasonably high population densities in the eastern, southeastern, and southwestern parts of the nation. 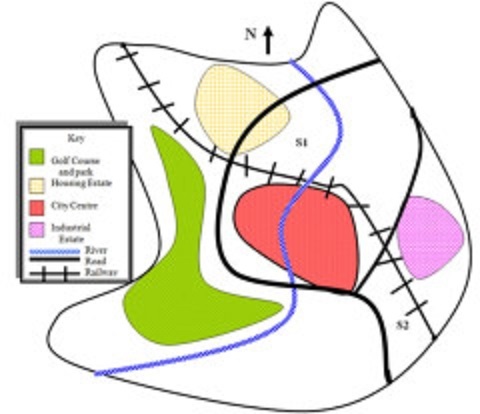 The picture shown is a guide to a city with two potential areas (S1 and S2). A golf ground and park possess the west of the city, and a river stream goes through the downtown area. The area S2 is arranged close to the downtown area, it verges on an industrial area. The area S1 is close to a housing estate. Both the locations are joined by a railroad. 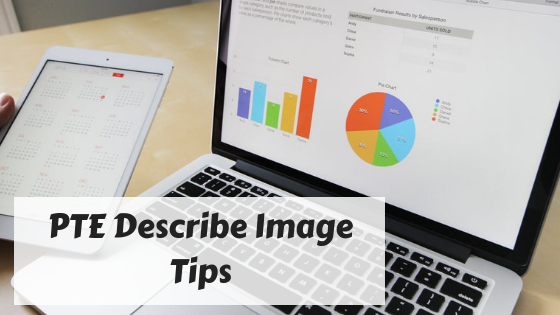 Are you looking for PTE Describe Image tips? In this article, you will find some great tips for describe image in PTE with useful examples.